Blend all the pumpkin roll ingredients in a large bowl until smooth. Pour batter in a pre-sprayed 8x8 or 8x11 baking pan lined with parchment paper. Remove from oven and place onto aluminum foil. Carefully roll up the cake and secure with aluminum foil. As cake is cooling, blend yogurt and cream cheese until smooth. Spoon the mixture into pumpkin roll. 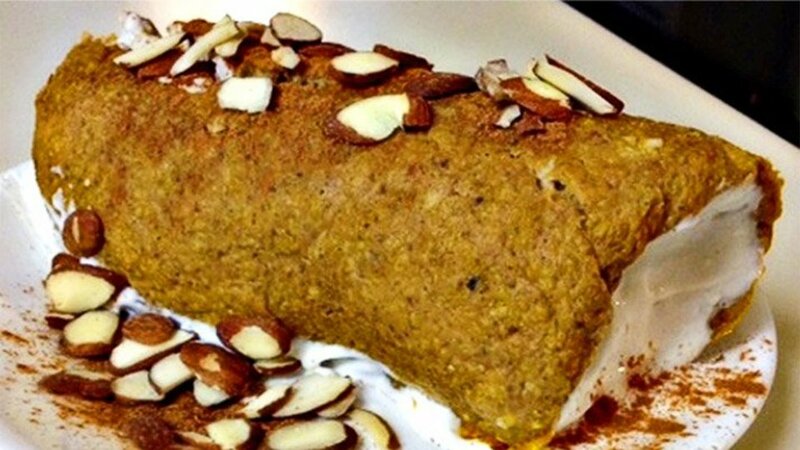 Top pumpkin roll with slivered almonds and cinnamon.